If my children had a choice, they would probably live off of watermelon if they could. 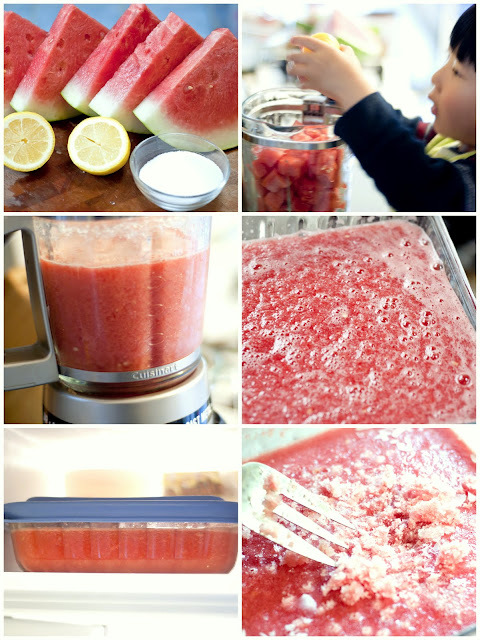 And though we've yet to test this, I think each of my sons could eat a whole large watermelon in one sitting. I would not be surprised. Well, thank goodness there's an endless supply of the fruit in the summer. 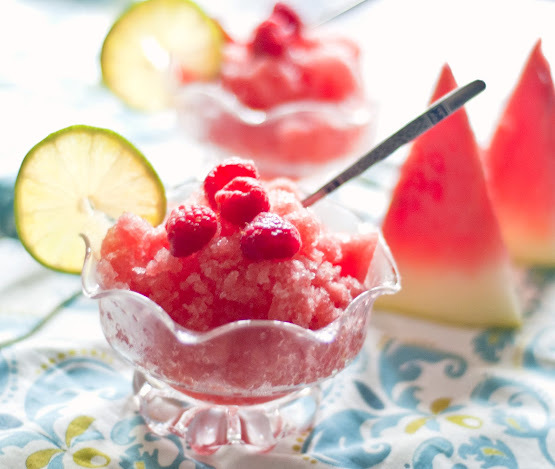 I'm trying to find more creative ways to prepare and serve it, and when I saw a watermelon granita recipe in the latest issue of Whole Living, I knew I hit the jackpot. And can I tell you how much my sons loved it? The real beauty of this delightful treat is how incredibly simple it is to make. My older son loved lending a hand in making this, almost as much as he loved eating it. Almost. 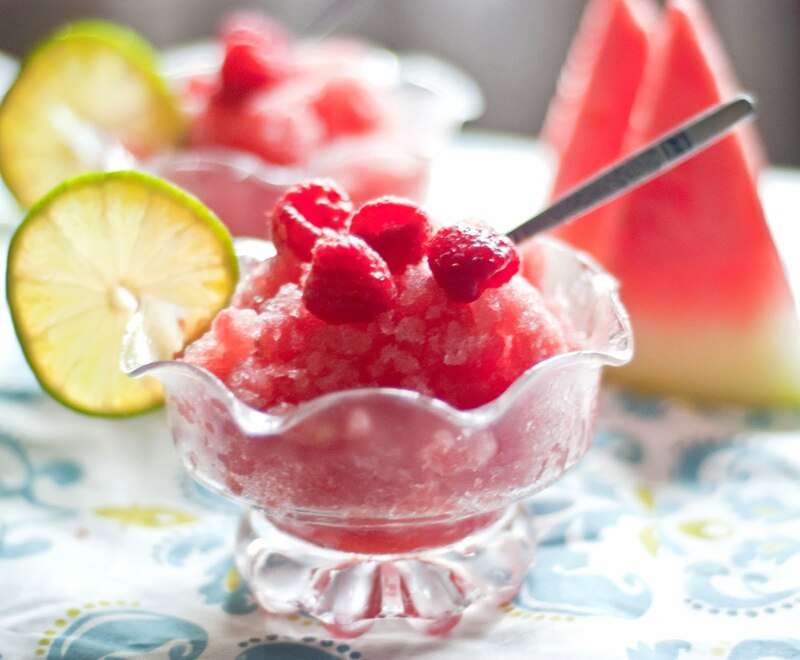 If you're having a barbeque or get-together this coming holiday weekend, I couldn't recommend an easier or more refreshing dessert to serve your guests. Garnish with mint or a slice of lime. 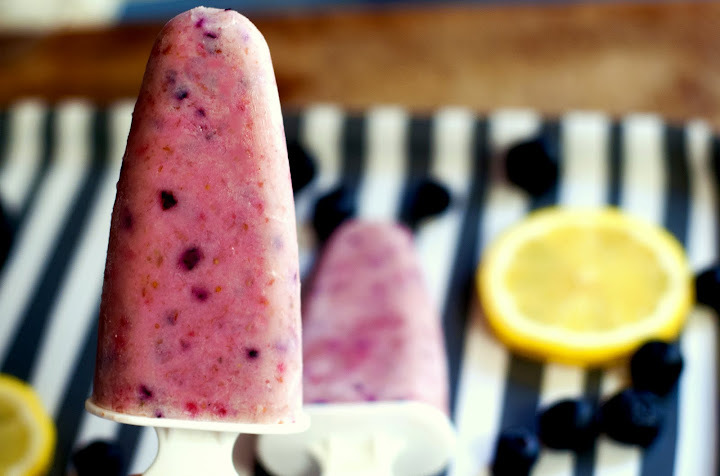 Top with raspberries or blueberries. And then grab a spoon and dig in. I guarantee you won't be disappointed. For recipe as featured on Whole Living, click here. I reduced the sugar to 1/4 cup, and it was just enough. 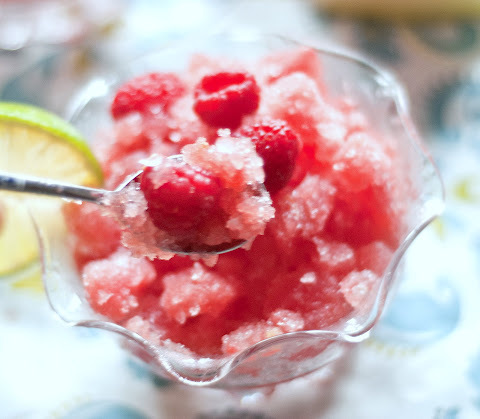 Garnish with lime and raspberries. Delicious. I sense a bounty of warm summer days coming our way. And oh, how we love it! The feel of freshly cut grass beneath your bare toes, the sip of ice cold raspberry lemonade, the joy of running through the water sprinkler, the smell of barbeque cooking on the gas grill, and a ready supply of fresh fruit and vegetables available from the backyard garden. What's there not to love? Maybe the pesky flies, but even then, I prefer summer over any other season. Growing up, however, nothing said summer like the abundance of frozen treats. I can remember summer days playing outside with my sister and brother and hearing the music of the ice cream truck nearing our street. We'd run inside our apartment to beg our grandfather for a couple dollars. 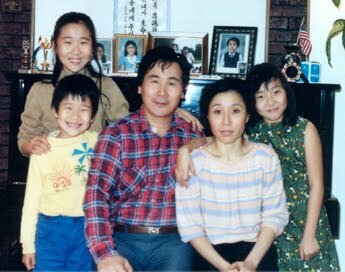 He could never say "no" to his grandchildren, so he'd reach deep into his pockets, pull out several quarters, and with lightning speed, my siblings and I would run out to the front of our apartment building waving down the truck. 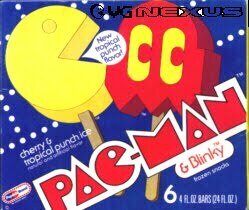 Our absolute favorites were the Rocket and Pac-Man popsicles. Ahh, the memories. Well, the ice cream truck doesn't seem to make its way around these parts too often. 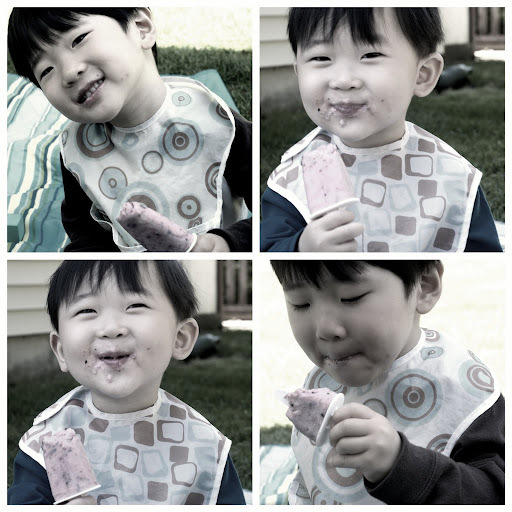 But that's okay because the kids are enjoying homemade frozen treats instead, which I prefer for them. 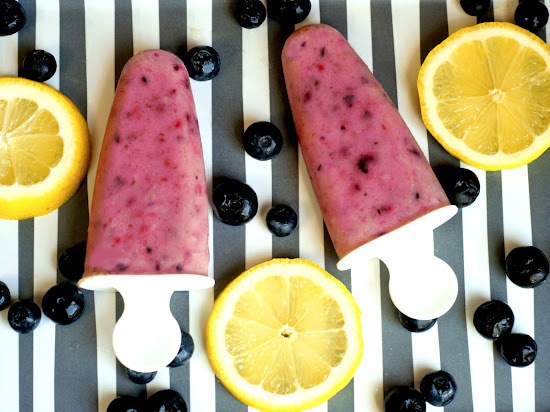 The boys love 'em and maybe one day, these will conjure up the same kind of nostalgia Pac-Man popsicles do for me. This little contraption here makes it so easy. 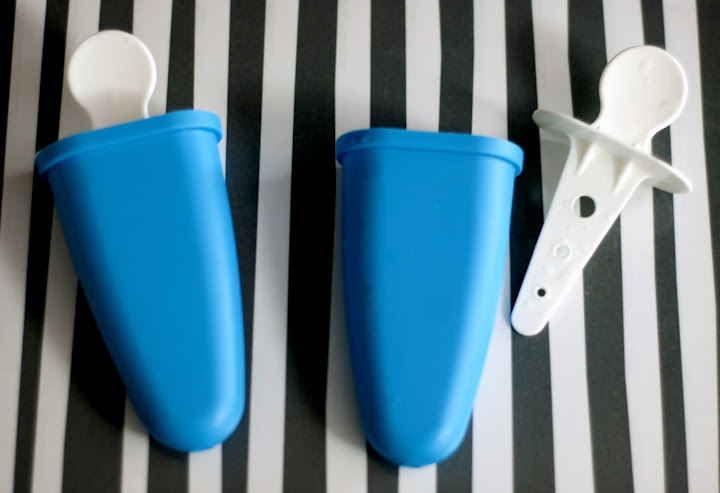 Can I tell you how much I love this popsicle mold from Ikea for less than $2 (comes with 6 individual molds)? It's one of the best purchases I've ever made. It gets used all summer long. Making these popsicles is so easy. 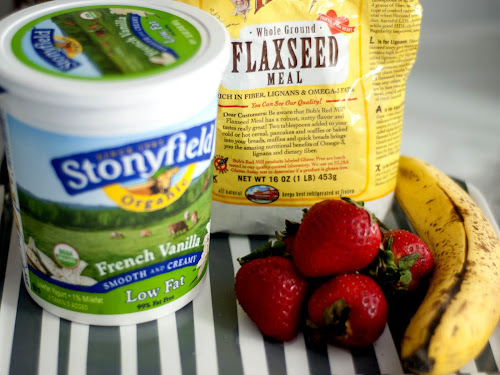 You take some fruit, yogurt, milk and/or orange juice and blend. I made the one pictured with strawberries, banana, blueberries, vanilla yogurt, milk, flax seeds, and a squeeze of lemon. Then you mix the ingredients in a food processor or blender until smooth. Pour it into the mold and freeze. And a couple hours later, viola. 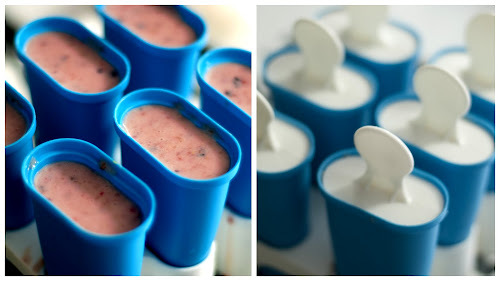 You have some very happy kids cooling off in the summer heat with a sweet treat. Today I thank God for the moms who have sacrificed, overcome obstacles, cared for, nurtured, prayed over, loved, and blessed their children and their families. This world is a better place because of you. And I praise God, in particular, for my mom, her mom, and the mom who raised my husband. For my mom - I'm thankful that you never gave up on us when that would have been the easiest think to do. Grateful that when it seemed like us against all the world, we had you in our corner. That when we packed up and moved yet again, we knew we'd have to say goodbyes but we could always count on having each other. I've been blessed by your endless prayers and encouraged by the faith that grips your heart. I admire you for so many reasons but am most thankful for your guidance and your friendship. For my mom's mom - Halmoni, we miss you so much. But I count myself incredibly blessed to have spent so many years with you here on earth and will again in eternity. 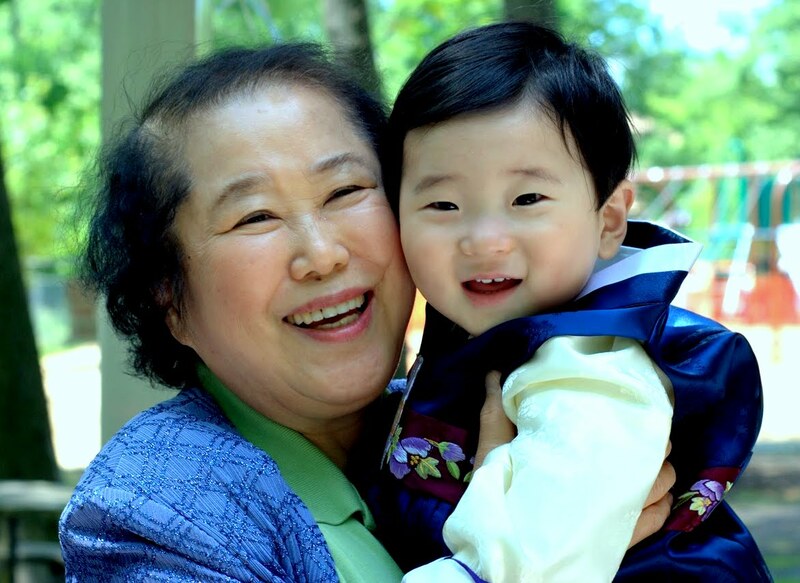 When everyone else was quick to judge or criticize, you always made your grandchildren feel loved and encouraged. You were a pillar of strength and amazing faith. Even in the final days of such great suffering, you blessed the name of Jesus. 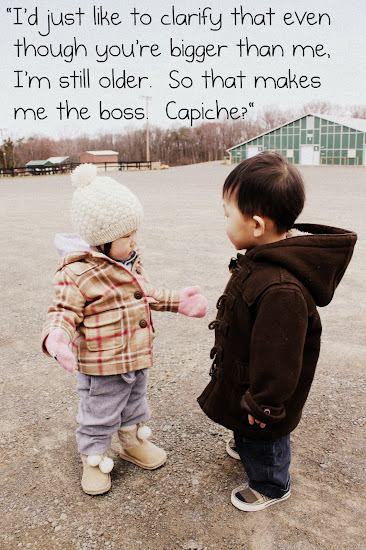 You inspire me. And for my husband's mom - I rarely, if ever, get to tell you these things: You are a wonderful mom, and there is no greater evidence than the two beautiful children you raised. I know you've sacrificed a lot and have worked so hard to provide a better life for your family. 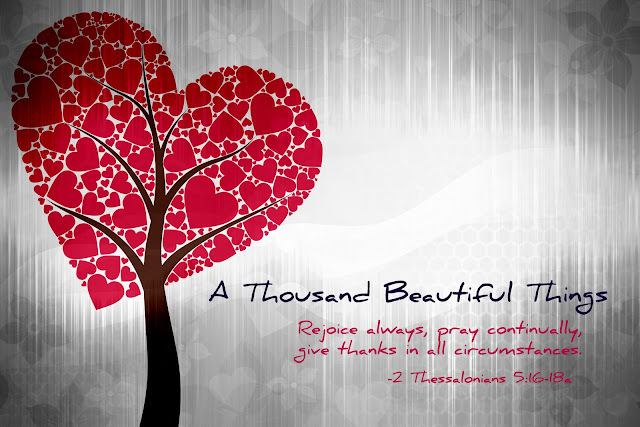 You are beautiful and loved and have a humble servant heart. 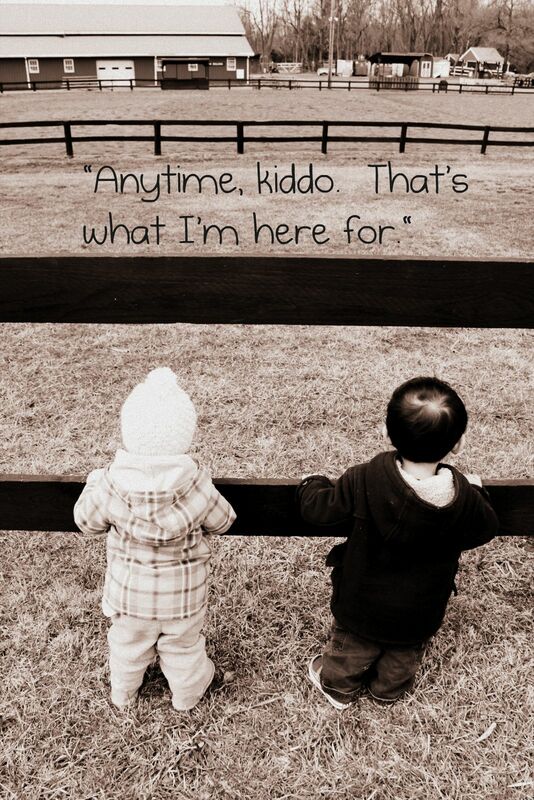 I am thankful for you in my life and for the incredible role you play in my children's. Happy Mother's Day to you beautiful ladies and to all the magnificent moms out there who give so much of yourselves for the sake of love. Thank God for all of you and for clean underwear! 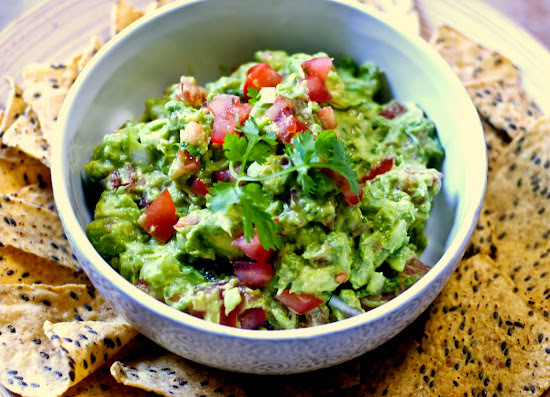 I love a good guacamole dip, but you just can't buy them in the stores. Thank goodness making your own is so simple. I first discovered how easy it is to make guacamole at a lunch outing years ago to a popular restaurant here in New York, Rosa Mexicano, near the Lincoln Center (this is their original location which opened in 1984 but they now have other locations throughout the country). This is considered an "upscale" Mexican restaurant, but honestly, the food is okay. I've gone a few times now, and the dishes I've had there haven't necessarily been astounding or make me want to go back for more. But the guacamole is a different story; it's the one reason I do go back. 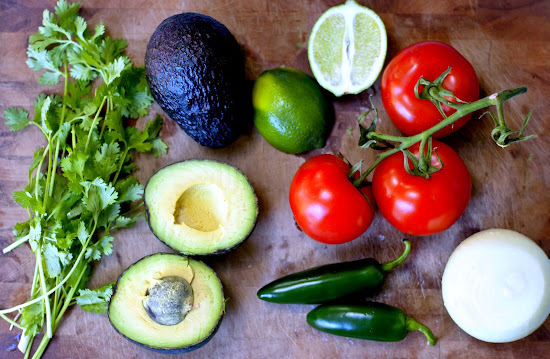 A server comes to your table with a cart full of fresh ingredients and prepares the guacamole in a traditional molcajete, a Mexican version of the mortar and pestle. I love that this is prepared right in front of you so you know exactly what's going into it. You can even indicate how spicy you'd like it, and they'll grind in more jalapeno in the paste for a little extra kick if you like (which I always do). But you don't need a molcajete to make this dip. A mortar and pestle will work just fine. The key is to use the freshest ingredients. These were picked up from our town's small supermarket a couple blocks from our house. Their produce is always exceptional. This guacamole is perfect for Cinco de Mayo or any occasion (even as a late night snack). Make the chile paste: Grind the onion, cilantro, jalapeño, and salt together in a molcajete until all the ingredients are very finely ground. Alternatively, use a fork to mash all the ingredients to a paste in a wide hardwood bowl. Cut each avocado in half, working the knife blade around the pit. Twist the halves to separate them and flick out the pit with the tip of the knife. Fold a kitchen towel in quarters and hold it in the palm of your “non-knife” hand. Rest an avocado half cut side up in your palm and make 3 or 4 evenly spaced lengthwise cuts through the avocado flesh down to the skin, without cutting through it. Make 4 crosswise cuts in the same way. Scoop the diced avocado flesh into the molcajete/bowl. Repeat with the remaining avocado halves.